New Relic allows to you monitor, diagnose and tune web applications written in many languages such as Ruby, Java, .NET, PHP and Python. This provides you with immediate insight from the end user's behavior, through servers, and down to individual lines of code. Insights by New Relic are currently not supported by this integration. Search for New Relic using the Search sources field. Alternatively, you can also scroll down the alphabetical list of integrations until you reach the New Relic integration. Click on the New Relic integration. Select the type of New Relic widget you want to add. When adding your first New Relic widget, you'll be asked to create a connection and authenticate your New Relic account so that we're able to collect your data and display it on the dashboard. You only need to create this connection once – we'll take care of the rest. The authentication box will ask you to Name this connection. Create a distinct name for your connection, to differentiate it from other accounts later on. You'll then need to enter your REST API key and Account ID. 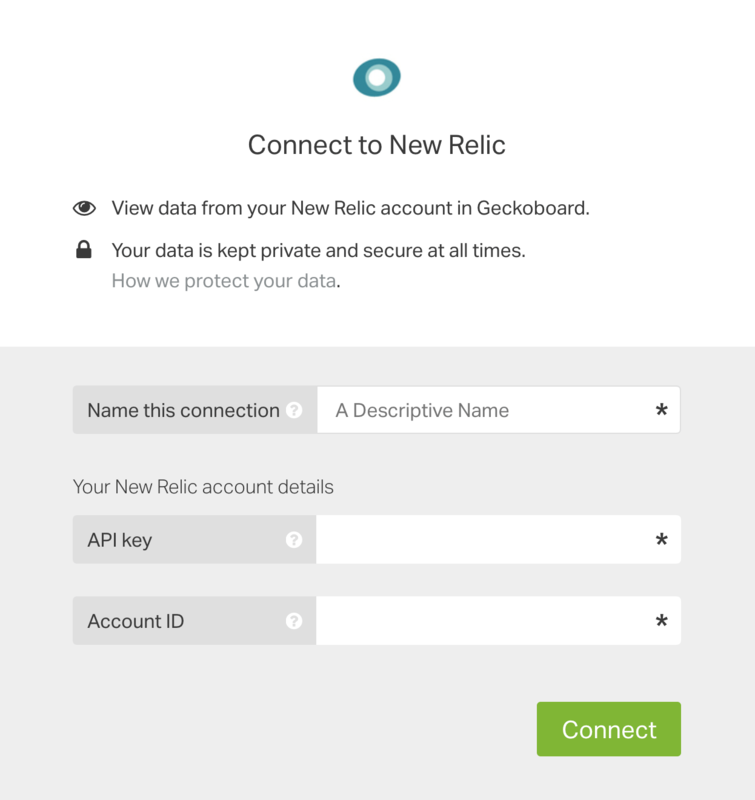 These are required by Geckoboard to access your New Relic account. From the New Relic menu bar, select Account Settings, Integrations, then API Keys. Click Create Rest API Key, or copy your existing key. In Geckoboard, paste the key into the appropriate field. Next, while signed into New Relic, find your Account ID by looking at your address bar. It is the number that follows /accounts/. Copy this Account ID, and paste into the appropriate field in Geckoboard. Highcharts make it possible to embed charts and visualizations you have access to in New Relic that are not available with Geckoboard's out-of-the-box widgets. In New Relic, drill down to the chart you wish to embed in your dashboard. Hover over the bottom right corner of the chart, click More, and then click Embed. Confirm that you want to embed a link, then a pop-up will appear that contains the code and a preview of the chart. These links will allow anybody who clicks them to view your data, however the link will not be discoverable by search engines or other New Relic users unless you choose to share it publicly. Next, click Add widget at the top right of your dashboard. 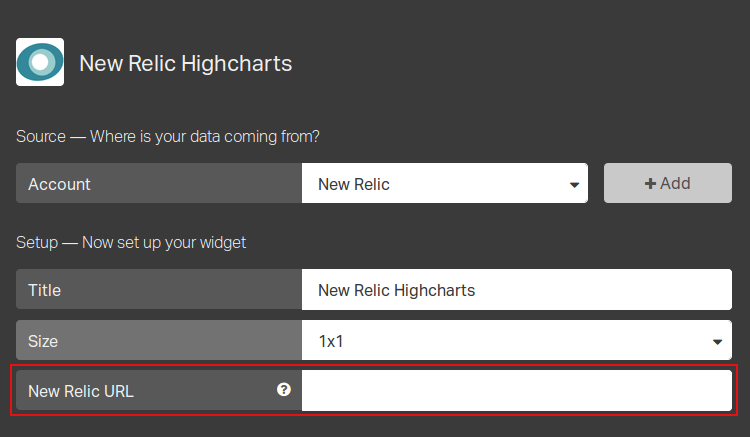 Click on the New Relic integration, then select New Relic Highcharts. If you've not yet created a connection, you will be asked to do so. See the create a connection steps above. Copy and paste the embed code from New Relic into the New Relic URL field. Click Add widget to save the configuration. 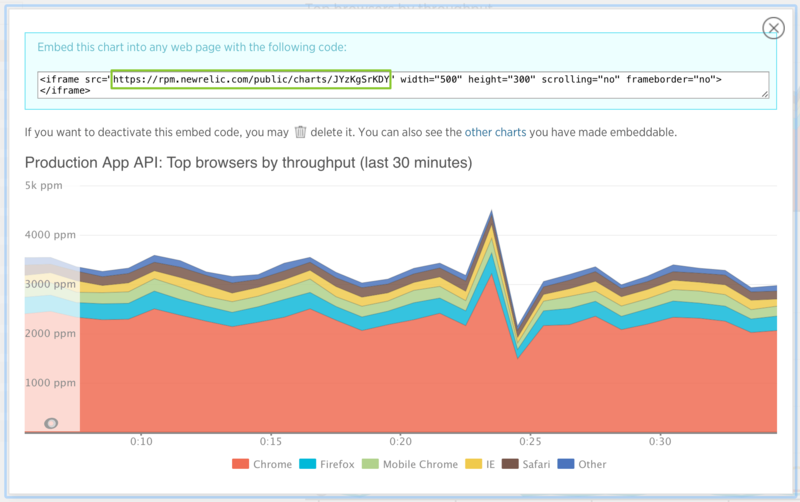 To view a list of embed links that have been created, log into your New Relic account, open Tools, then Embedded Charts.